That’s exactly what you get when you choose Anchor glass kitchenware! Anchor products are built tough and designed to last through pretty much anything in the kitchen. Anchor’s Small Slate Serving Set is the perfect tableware for your next dinner party. Included in this two piece set is a small dome expertly crafted from glass, as well as a rustic, slate serving tray. The slate tray’s surface acts as a chalkboard, allowing you to easily label your favourite cheeses and dips, and when you’re finished, the writing just wipes away with ease. Dome is crafted from glass. Tray is crafted from slate. Tray’s surface acts as a chalkboard for easy labelling. Ideal for serving cheese platters. Slate is hand wash only. Presented as a set of two in an Anchor box. 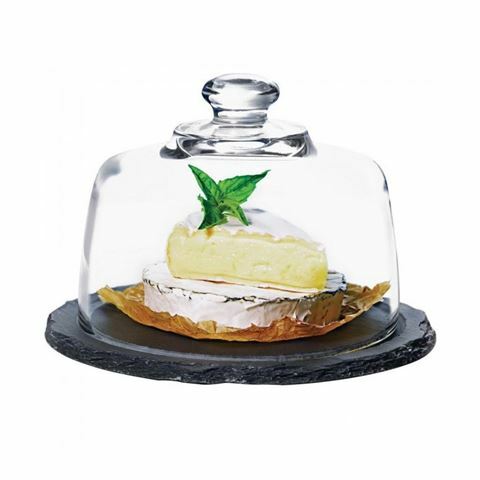 Small Glass Dome – 13cm (h) x 16.5cm (w). Small Slate Tray - 20cm (w).